Low-cost housing in South Africa – a story of fraud, corruption, and general mismanagement. The low-cost houses in Vukani, a district in Grahamstown’s township, are in a seriously poor condition, displaying cracking walls, loose bricks, and leaking roofs. But Vukani is not the only housing project to be in such a poor state, and all over South Africa housing projects have become the subject of often scathing news reports. “Over the last few years, many communities have shown their growing dissent over the government’s perceived poor levels in service delivery [in housing]” (Burgoyne, 12). In Vukani, experts have attributed the dismal state of Vukani housing to the use of emerging contractors, various degrees of corruption, poor planning and monitoring on the part of Makana municipality, and so on. Burgoyne writes that “the housing strategy lacked coherency and inadequately defined the roles and responsibilities of all role players in the housing sector.” According to Burgoyne, “this has contributed to the present breakdown in delivery and confusion as to housing responsibilities” (13). The latest version of the South African Housing Code better defines the responsibilities of the various players in the housing sector, and most importantly that of local government. In terms of health of safety for instance, the municipality must “ensure that conditions not conducive to the health and safety of the inhabitants of its area of jurisdiction are prevented or removed” (South African Housing Code). Now if we ignore all the other clauses stipulating Makana’s responsibility for the problem in Vukani, the health and safety clause is clear. When we were in Vukani, many of the 1000 houses built had loose bricks over doorways, and even walls that swung roughly 1 cm in a slight breeze – these pose clear safety risks. A mother residing in Vukani was particularly concerned that the loose bricks above her front door would fall down and fatally injure her young children. The Media and Communication’s officer at Makana municipality denies responsibility for the problem, while the Public Services Accountability Monitor (PSAM) and other sources claim this to be false. Similar problems have arisen nation-wide. In an online story published by City Press, reporters state that a common problem with low-cost housing in several provinces is “shoddy workmanship” (Dumisane Lubisi, Jackie Mapiloko, Makhudu Sefara). In the Eastern Cape’s case, the poor quality of the houses may be attributed to several factors, but Lubisi, Mapiloko and Sefara point out a crucial error on the part of the provincial government. “The province elected to build a 40m² house using a conditional grant allowance which was based on a 30m² unit as the national norm,” Phumlani Mndolomba of the Eastern Cape Housing Department is quoted as saying (Lubisi et al). The problem of poor workmanship of housing projects has also occurred in Mpumalanga, where the province had to destroy a housing project amounting to R9.5-million after is was discovered that “the developer had used “weak bricks” to build the 427 units” (Lubisi et al). Mamelodi, a housing project on the periphery of Tshwane, Guateng, has also been declared of an inferior quality. “The more than 600 houses constructed to date are so defective that the Tshwane metro council refuses to issue occupation certificates and allow them to move in”, writes Waldner in City Press. Apparently, Tshwane metro did not approve any of the houses in Mamelodi’s Extension 22 because the “poor workmanship and materials used do not meet the minimum standards set by national building regulations” states council spokesperson Antoinette Mostert. Ndivhuwo Mabaya, national housing department spokesperson, has stated that in cases where houses were of poor quality or where developers had disappeared after being paid, government would track down the developers and recover the money (Lubisi et al). In our investigation however, allegations were made that often beneficiaries of these sub-standard houses are intimidated by those responsible for the problem, including contractors and local government, and so they do not have a space to voice the problems with their homes. In Mamelodi, some houses were allegedly built on crooked foundations, the windows have no glass, and there are no storm-water pipes (Waldner). The latter of these is also evident in the houses of Vukani, and because the project is based on a slope, flooding and winter rains are potentially very hazardous to the safety of Vukani residents. Delmas, Mpumalanga, has also been the site of an even worse standard of low-cost housing. Here, roughly 500 houses are subject to poor and defective sewerage systems, among other things. Mokoena writes that roughly 500 houses in Delpark Extension 2 are “surrounded by a trench of dirty, stinking water, which contains faeces”. There are also “leaking water pipes, roofs, drains and toilets. Others have no window panes, doors and sewer pipes” according to Mokoena. 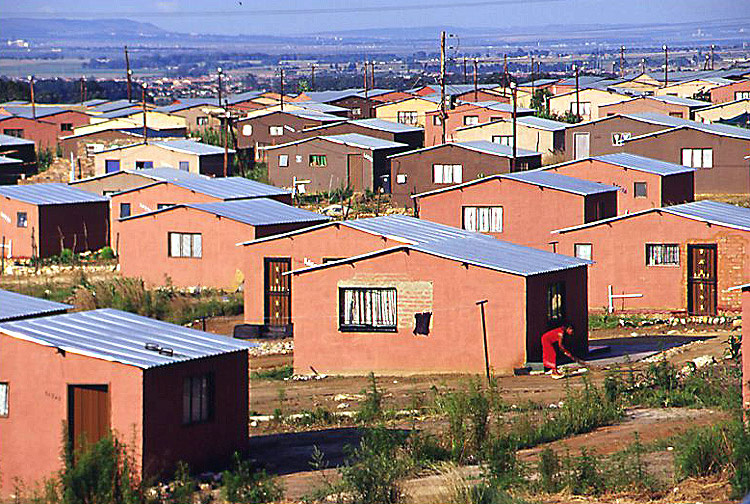 The national housing project has aimed to provide the many South Africans living in informal settlements (corrugated iron shacks) with “adequate housing”. In the South African constitution, it is a right to have such housing, but to the dismay of low-cost housing beneficiaries nation-wide, housing departments are not even meeting national standards for these housing. And we fail dismally and completely on an international scale. Burgoyne. “Factors affecting housing delivery in South Africa”. Dumisane Lubisi, Jackie Mapiloko, Makhudu Sefara. City Press. “R2bn housing scandal”. Mariechen Waldner. City Press. “Shack dwellers rue defective homes”. Matefu Mokoena. City Press. “Mayor slammed over poor-quality houses”.